It was the night of the infamous Hercules snow storm that was about about to take New York City by… well, storm. Being a Buffalo native, I was incredibly skeptical of any sort of weather issues that would shock me in my new downstate home — Boerum Hill. But nonetheless, I was really looking forward to a cozy night in cooking and tidying up around the apartment. The dinner of choice — breakfast. Pairing together what I already had in my fridge (and not wanting to venture out into the cold temperatures again), I had all the fixings for a great start of the day meal, at the end of the day. Ingredients: measured as a quick dish for one, but you can double to make it for two. Start by drizzling a tablespoon or two into a saucepan over the stove. Lightly sprinkle the garlic powder and crushed red pepper flakes into the oil to heat up. 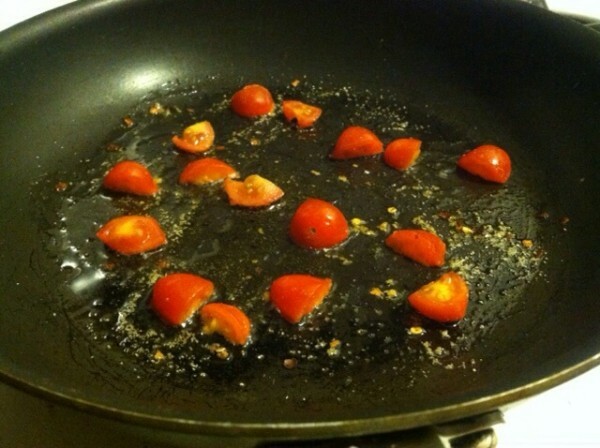 Slice the cherry tomatoes into halves or quarters (depending on how big you’d like them in your scramble) and toss them in the saucepan with the heat on low. 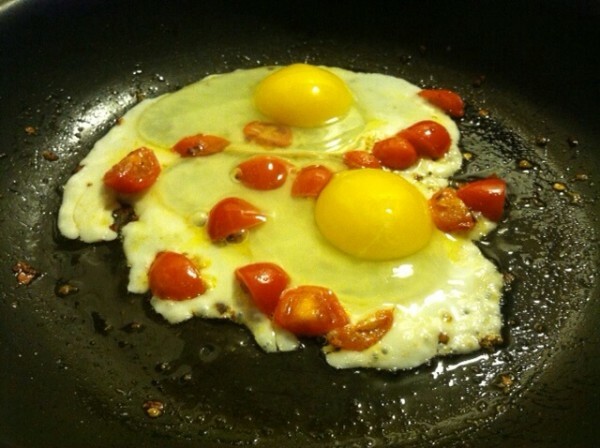 Once the tomatoes have simmered for a few minutes and are starting to slightly wrinkle, you can add your two eggs to the pan. 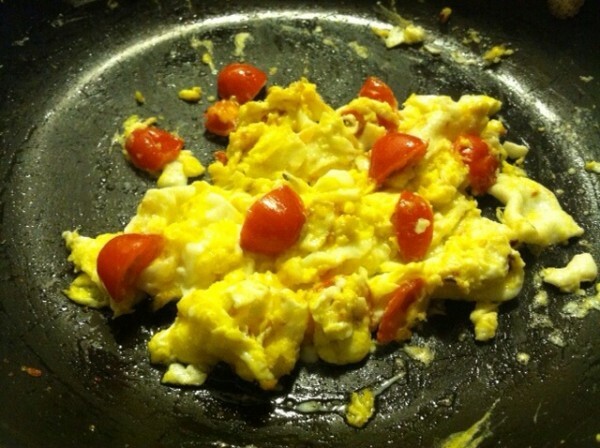 Mix the yolks and egg whites together for a even scramble with the tomatoes. Now you can sprinkle a little salt and pepper to the mix for flavor. Let the eggs simmer for a minute or two without touching them, then scramble up to your desired consistency. I like mine a little dry instead of runny. Once plated, sprinkle the goat cheese on top of the eggs (I added this at the last minute to avoid melting the cheese). With a nice glass of milk or a side of toast, you’ll be enjoying breakfast for dinner in no time! But for those of you who’d like to kick it up a notch, feel free to go nuts with hot sauce to serve it up on top of your eggs. It’s rare that I have a nice scramble without adding a bit of Frank’s Hot Sauce. It’s a staple condiment in my fridge. 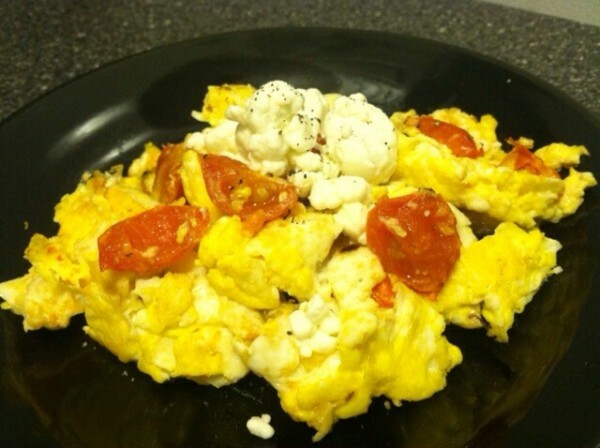 Tags: breakfast, dinner, eggs, goat cheese, recipes, scramble, tomatoes. Bookmark the permalink.